Download "Welcome to Sookasa. 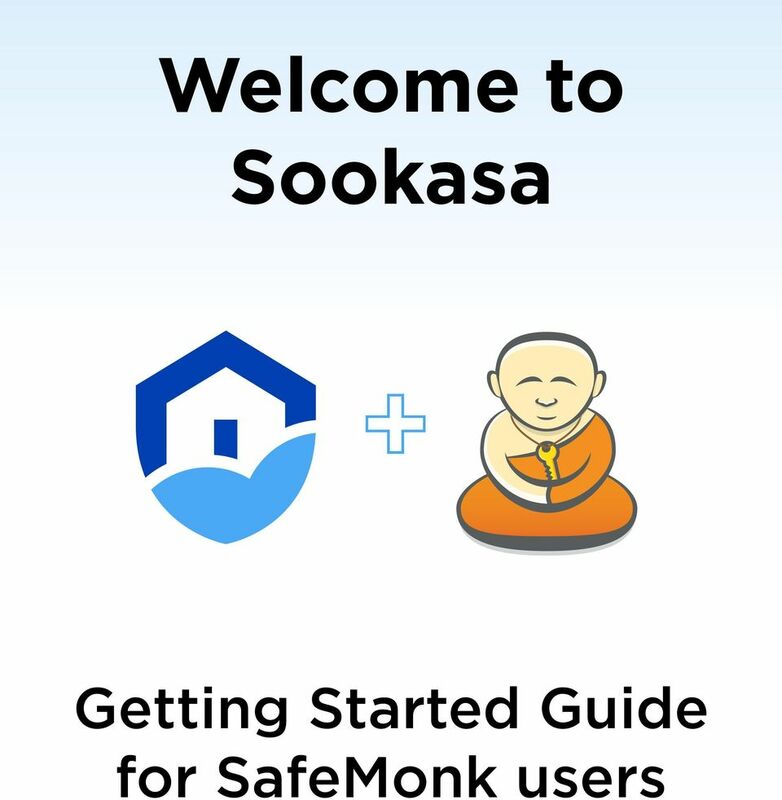 Getting Started Guide for SafeMonk users"
2 Welcome to Sookasa! About Us Like Safemonk, Sookasa provides Dropbox encryption to protect your information at the file level, so it s safe both on the cloud and on all your devices. With Sookasa, you can share encrypted folders and files natively through Dropbox. With our proprietary File Delivery platform, you can also exchange files with those who don t have Dropbox or Sookasa. We give you total control over who can access your files, so you can easily authorize collaborators or restrict access to specific files. With Sookasa, your files are always protected even if you ve lost a device or no longer wish to share your files with someone you previously authorized. You can prevent access from any device with a click of a button. What s more, Sookasa allows you to centrally audit file access for all your encrypted files even after they ve been downloaded to devices or shared externally. Sookasa complies with required HIPAA safeguards, and we ve passed extensive third-party security and HIPAA audits to prove it. Sookasa also signs Business Associate Agreements with users of our compliance plan. Sookasa also enables PCI DSS, and FERPA compliant use of Dropbox. 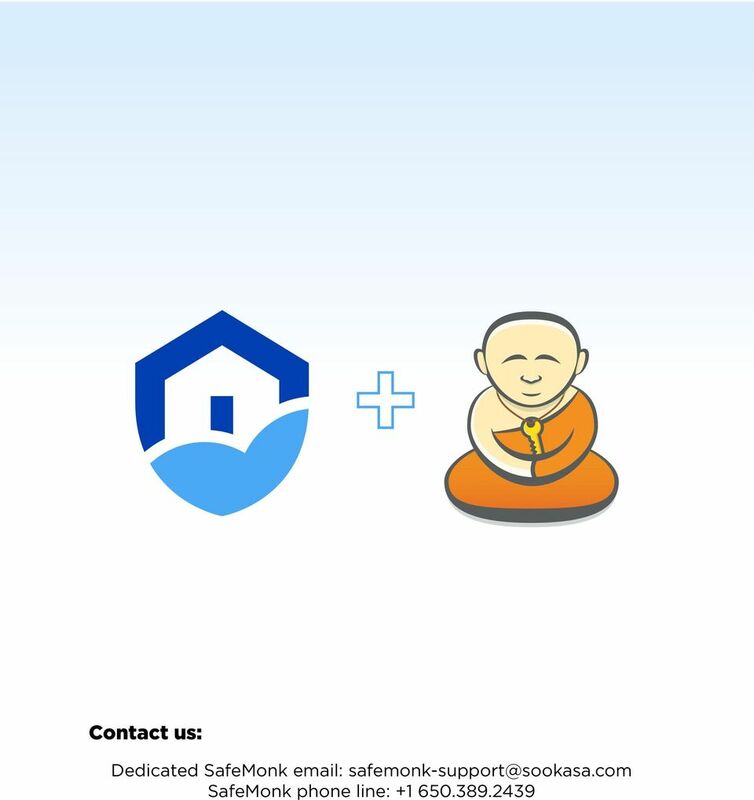 How to move from SafeMonk to Sookasa You can make the transition from SafeMonk to Sookasa in 5 easy steps: 1. Unshare any shared SafeMonk folders. 2. Decrypt your files in SafeMonk and uninstall the program. 3. Download Sookasa and start the application. 4. 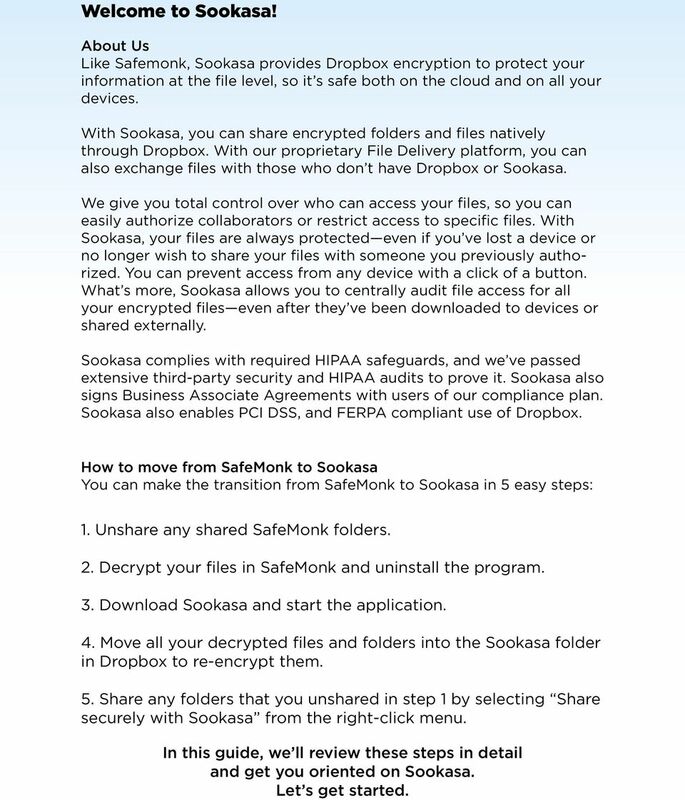 Move all your decrypted files and folders into the Sookasa folder in Dropbox to re-encrypt them. 5. Share any folders that you unshared in step 1 by selecting Share securely with Sookasa from the right-click menu. In this guide, we ll review these steps in detail and get you oriented on Sookasa. Let s get started. 3 How to decrypt SafeMonk files We re friends at SafeMonk and Sookasa, but our two encryption programs can conflict with each other when both are installed on your device. So before you can transition to Sookasa, you ll need to decrypt your SafeMonk files and uninstall SafeMonk. To decrypt content inside SafeMonk: Unshared Folders: Simply drag the folders out of the SafeMonk folder to your Desktop while the SafeMonk app is running to decrypt the folder s content. We recommend moving them to your Desktop so your files don t sync unencrypted to the cloud. For step-by-step instructions for unshared folders, skip to step 3 below. 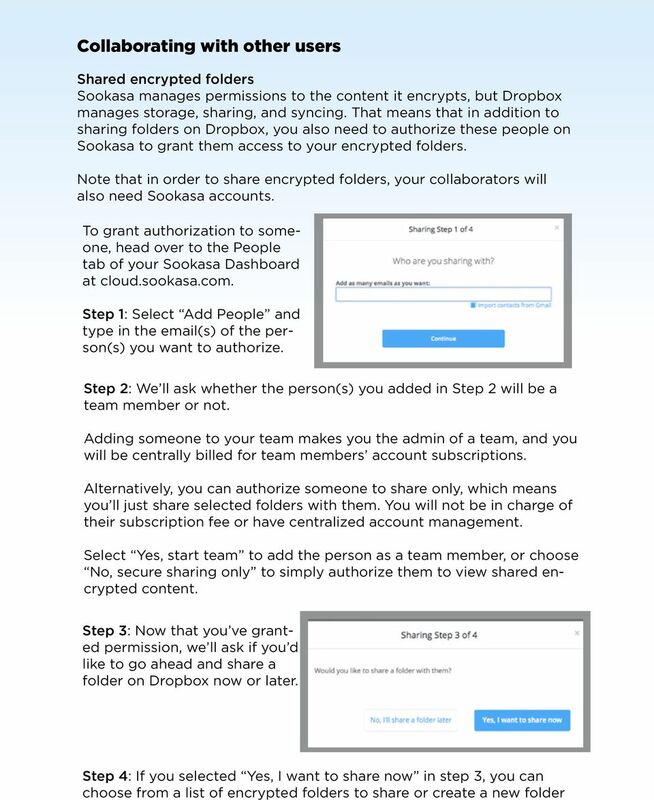 Shared folders: Before you decrypt, you ll need to unshare these folders on Dropbox. Select the option to not allow the collaborators to keep a copy of the files before decrypting the folder s content. Here s how: 1. Click Share next to the shared folder and select Invite people to collaborate. 2. In Shared folder options, select Unshare folder to discontinue sharing with your collaborators. Choose not to allow others to keep a copy of the folder. You ll still have a copy of the folder in your Dropbox account. After you have unshared folders, you can decrypt the content. 3. While the SafeMonk application is running, drag your SafeMonk files and folders out of SafeMonk to a location other than Dropbox (that way, they won t be synced unencrypted to the cloud). For example, you can drag these files to your Desktop. 4. Quit SafeMonk and try opening some of your files to confirm that your files have been decrypted. 5. Log out and uninstall SafeMonk from your computer. 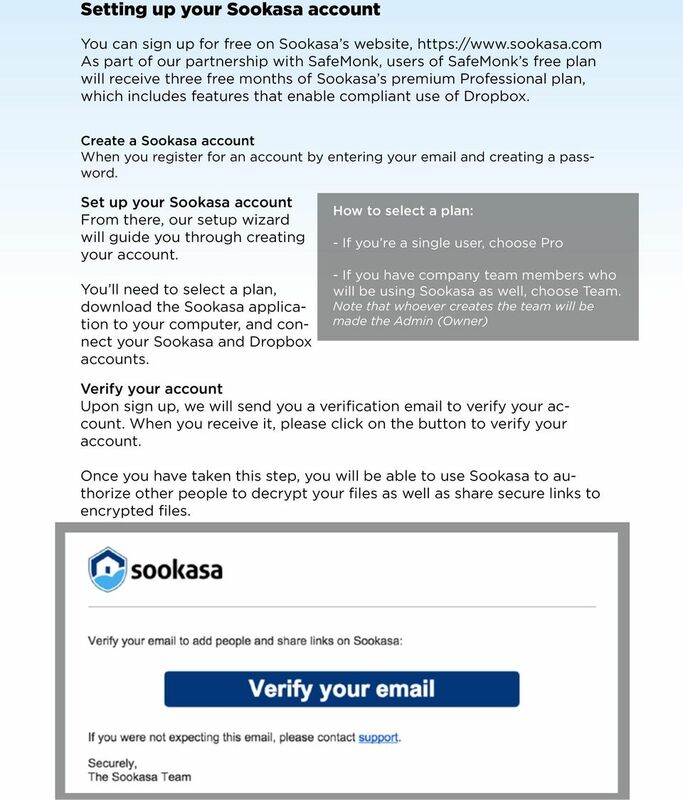 4 Setting up your Sookasa account You can sign up for free on Sookasa s website, As part of our partnership with SafeMonk, users of SafeMonk s free plan will receive three free months of Sookasa s premium Professional plan, which includes features that enable compliant use of Dropbox. Create a Sookasa account When you register for an account by entering your and creating a password. Set up your Sookasa account From there, our setup wizard will guide you through creating your account. You ll need to select a plan, download the Sookasa application to your computer, and connect your Sookasa and Dropbox accounts. How to select a plan: - If you re a single user, choose Pro - If you have company team members who will be using Sookasa as well, choose Team. Note that whoever creates the team will be made the Admin (Owner) Verify your account Upon sign up, we will send you a verification to verify your account. When you receive it, please click on the button to verify your account. Once you have taken this step, you will be able to use Sookasa to authorize other people to decrypt your files as well as share secure links to encrypted files. 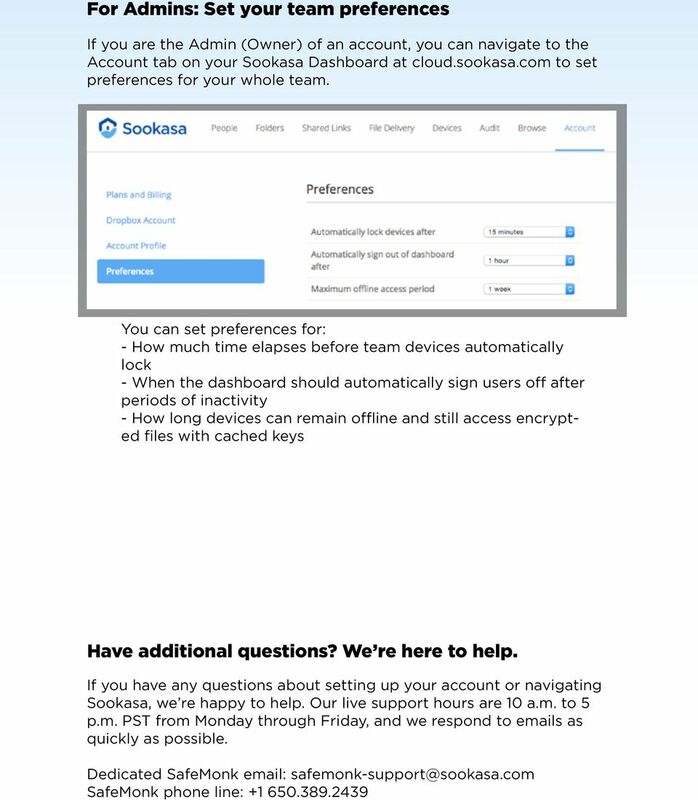 5 How to use Sookasa Launch Sookasa Once you ve created your account and installed the application, you re ready to get started using Sookasa When you launch the application for the first time, you will need to sign in with the credentials you created. If your app is locked, you can unlock it by entering your password. On your computer, you will find the Sookasa app icon in the system tray (on Windows) and menu bar (on Mac). 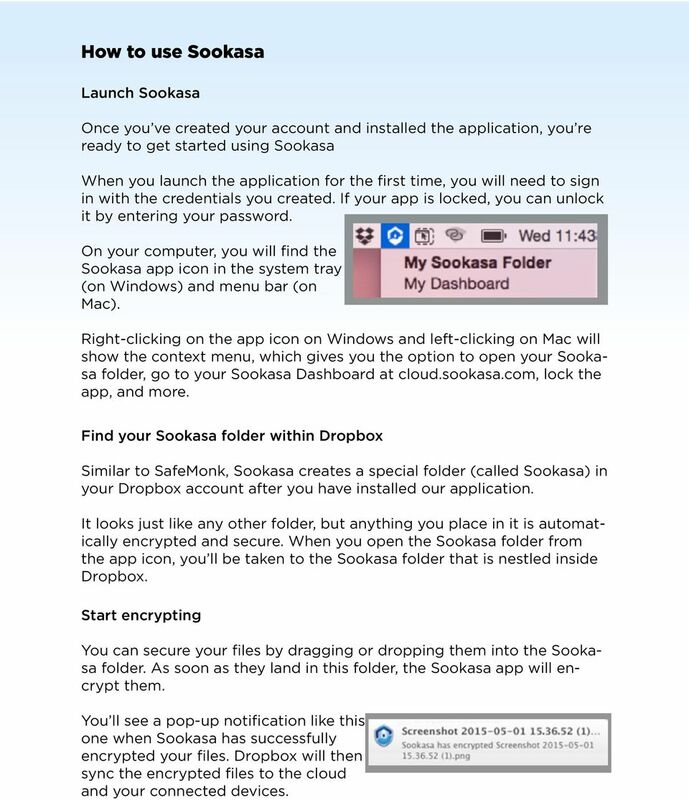 Right-clicking on the app icon on Windows and left-clicking on Mac will show the context menu, which gives you the option to open your Sookasa folder, go to your Sookasa Dashboard at cloud.sookasa.com, lock the app, and more. 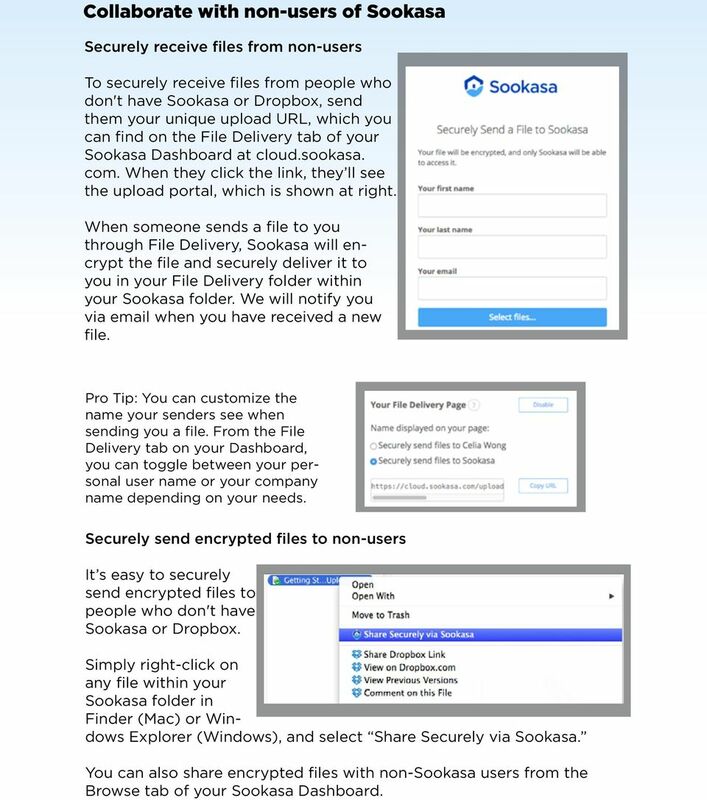 Find your Sookasa folder within Dropbox Similar to SafeMonk, Sookasa creates a special folder (called Sookasa) in your Dropbox account after you have installed our application. It looks just like any other folder, but anything you place in it is automatically encrypted and secure. When you open the Sookasa folder from the app icon, you ll be taken to the Sookasa folder that is nestled inside Dropbox. Start encrypting You can secure your files by dragging or dropping them into the Sookasa folder. As soon as they land in this folder, the Sookasa app will encrypt them. You ll see a pop-up notification like this one when Sookasa has successfully encrypted your files. Dropbox will then sync the encrypted files to the cloud and your connected devices. 6 Sookasa Dashboard Sookasa s centralized, web-based Dashboard can be used to view your account details, set up or alter collaborating details, and browse your files. You can access your Dashboard at cloud.sookasa.com. If you re a team admin, you can also use this dashboard to get a holistic view of your team s accounts, including timeout preferences, devices, and external sharing partners. People tab: You ll land on the People tab when you log in to cloud. sookasa.com. This tab is provided to help you manage collaborators who are authorized to view your encrypted files. From this tab, you can view your Team Members and External Partners at a glance, as well as add or delete these authorized users. 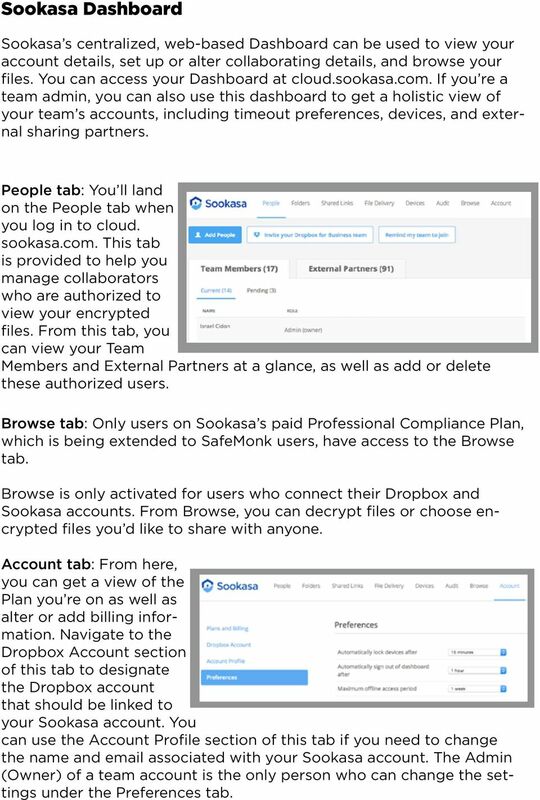 Browse tab: Only users on Sookasa s paid Professional Compliance Plan, which is being extended to SafeMonk users, have access to the Browse tab. Browse is only activated for users who connect their Dropbox and Sookasa accounts. From Browse, you can decrypt files or choose encrypted files you d like to share with anyone. Account tab: From here, you can get a view of the Plan you re on as well as alter or add billing information. Navigate to the Dropbox Account section of this tab to designate the Dropbox account that should be linked to your Sookasa account. You can use the Account Profile section of this tab if you need to change the name and associated with your Sookasa account. The Admin (Owner) of a team account is the only person who can change the settings under the Preferences tab. 8 Collaborate with non-users of Sookasa Securely receive files from non-users To securely receive files from people who don't have Sookasa or Dropbox, send them your unique upload URL, which you can find on the File Delivery tab of your Sookasa Dashboard at cloud.sookasa. com. When they click the link, they ll see the upload portal, which is shown at right. When someone sends a file to you through File Delivery, Sookasa will encrypt the file and securely deliver it to you in your File Delivery folder within your Sookasa folder. We will notify you via when you have received a new file. Pro Tip: You can customize the name your senders see when sending you a file. From the File Delivery tab on your Dashboard, you can toggle between your personal user name or your company name depending on your needs. Securely send encrypted files to non-users It s easy to securely send encrypted files to people who don't have Sookasa or Dropbox. Simply right-click on any file within your Sookasa folder in Finder (Mac) or Windows Explorer (Windows), and select Share Securely via Sookasa. You can also share encrypted files with non-sookasa users from the Browse tab of your Sookasa Dashboard. Meet Drive. Find your files easily with Drive, and keep all your documents safe and secure. Cox Business Online Backup Quick Start Guide Release 2.0 Cox Business Online Backup Quick Start Guide i IMPORTANT: You must notify Cox in advance if you would like to move or relocate your telephone Service. IONU BETA USER MANUAL IONU Security, Inc. This document also includes steps on how to login into HUDMobile with a grid card and launch published applications. Versions Addressed: smarshencrypt 2.0 Document Updated: 7/30/2010 Copyright 2010 Smarsh, Inc. All rights Purpose: This document will guide the end user in receiving and viewing smarshencrypt secure messages.